In this photo provided by Chelyabinsk.ru, a meteor contrail is seen over Chelyabinsk on Friday, Feb. 15, 2013. There aren't yet any advance warning systems that could give Earthlings a heads-up before an untracked space rock hits. But a telescope project in Hawaii aims to change that, and potentially provide a chance for those in threatened areas to evacuate. 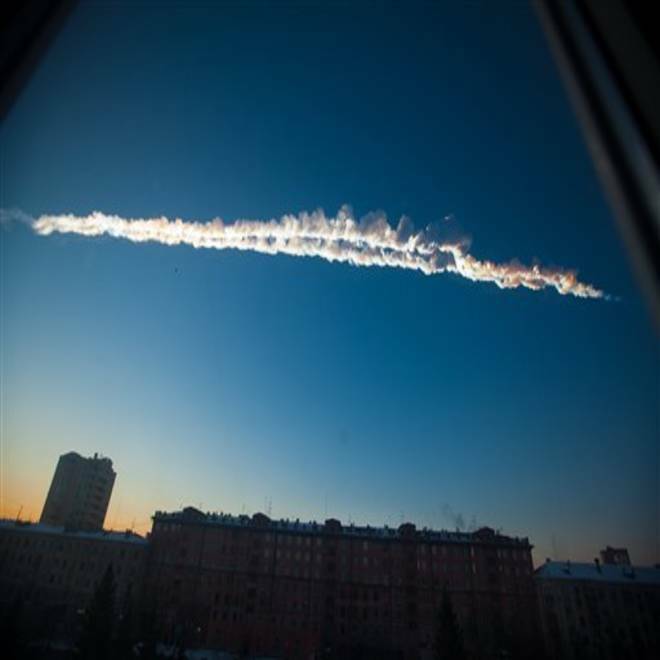 A meteor alert might have made a difference to Russia's Chelyabinsk region on Friday. "There are excellent ongoing surveys for asteroids that are capable of seeing such a rock with one to two days' warning, but they do not cover the whole sky each night, so there's a good chance that any given rock can slip by them for days to weeks. This one obviously did," astronomer John Tonry of the Institute for Astronomy at the University of Hawaii told NBC News Friday. Tonry is one of the key players in a NASA-backed effort to build ATLAS (Asteroid Terrestrial-impact Last Alert System), two observatories in Hawaii that can simultaneously scan the entire visible sky twice a night. "If ATLAS were up and running we might very well have seen" the meteor that hit Russia, he said, and "could have provided one to two days' warning." However, he adds, the success of detection "depends on a couple of assumptions." One is that it's not cloudy. Another is that the asteroid doesn't go over the South Pole, "where ATLAS cannot see." Telescopes, Tony said, "can only see the sky above the horizon, obviously. A telescope that's sited in the northern hemisphere (which ATLAS will be) cannot see all the way to the South Pole of the sky." And, "if the asteroid were coming from that direction, there's a good chance that it would never rise above the horizon for a northern telescope before it hits." While it would "easy to build multiple copies of ATLAS and put some in the south, and spread them out so they see different weather patterns ... that's for the future," he said. Dozens were hospitalized and nearly 1,000 residents suffered minor injuries from fallen debris and the impact of the meteor's powerful landing. NBC's Tom Costello reports. The ATLAS telescopes are "just now" being built, Tonry said; ATLAS should "start running around the end of 2014 and be fully operational by the end of 2015." NASA has provided $5 million in funding for ATLAS. At one time, NASA considered launching an asteroid-hunting probe, but that didn't go forward because of the cost, estimated at $500 million almost a decade ago. Other private efforts are in the works, too. Last year, leaders of the nonprofit B612 Foundation, including Apollo astronaut Rusty Schweickart, started a campaign to fund and launch a space telescope that will hunt for potential killer asteroids over the course of five and a half years. Another venture, from a group called Planetary Resources, ultimately wants to do asteroid mining, but says its first step is to "launch an orbital fleet of 'personal space telescopes' capable of looking out into the heavens or back down on Earth," wrote Alan Boyle, NBC News.com's Science editor last year. Suzanne Choney is a contributing writer for NBC News.com. You can follow her on Twitter. NASA looks at the flyby of asteroid 2012 DA14 from several amateur observatories across Australia.